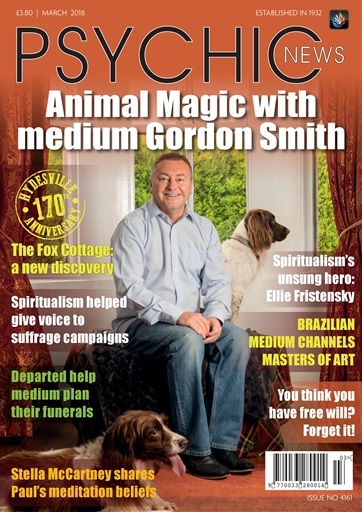 In the March issue of Psychic News, medium Gordon Smith talks to us about his unique perspective on animals and discusses their intuition, unconditional love and the impact they have on the lives of so many of us. On the 170th anniversary of Hydesville, historian Elton Brumfield reveals a new discovery from the Fox Cottage. We report on Brazilian medium Florencio Anton, who recently visited London and channels great masters of art. We report on the paranormal interests of the now sadly passed singers Dolores O’Riordan from The Cranberries and Mark E. Smith from The Fall. 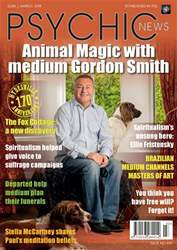 Plus a chance to win one of ten copies of James Van Praagh’s latest book, Wisdom From Your Spirit Guides.